Make showers and parties extra memorable with modern twists. Plan your next baby shower to be as unique as the mother-to-be you’re honoring. It’s easy to organize a fantastic fete with these innovative suggestions. Design a festive invite by measuring out two yards of two pink, blue or yellow ribbons, depending on the gender or theme of the occasion. In permanent marker, write the event’s details on one of the ribbons and ask guests to bring the second ribbon to the gathering after they write a personal sentiment on it for the mom-to-be. They might want to offer well wishes or parenting advice. Fold up the ribbons and place them in a small padded envelope, along with a tiny plastic baby, which can be purchased at craft or hobby stores. Mail envelope to guests and await some eager RSVPs. Celebrate a child’s early birthday with little hassle thanks to these party planning suggestions. Schedule the celebration to be short and sweet. An hour or an hour and a half is usually long enough. Host a late morning or late afternoon party to prevent interrupting the little guy’s nap schedule. Invite a close group of friends and family. Babies are easily overwhelmed and enjoy a handful of guests more than a whole house of acquaintances. Hire a babysitter to assist you with prepping and hosting the get-together. Occupy young guests to prevent restlessness. However, don’t overwhelm them with activities. Keep it simple. Take a ton of pictures to remember this milestone forever. Turn the party room into a nursery. First, hang up a clothesline adorned with baby clothes. Next, fill the space with pink, blue or yellow helium-inflated balloons. Either float them on the ceiling, use them as table arrangements or tie them to the backs of chairs with matching streamers. You can also draw funny faces on the balloons or write baby name suggestions. Complement the balloons with inexpensive bibs in a color that goes well with the decor and use them as place mats. Also, try making a centerpiece that doubles as a gift for the expecting mom. You can do this by lining a basket with a receiving blanket and filling it with baby items, such as lotions, bath toys, pacifiers and bottles. 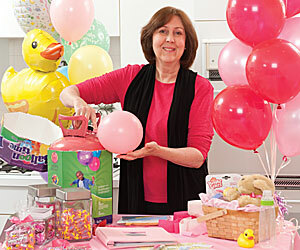 You could also look up online directions for assembling a diaper cake as a centerpiece. Eat Your Peas: Purchase different baby foods, remove the lids, wrap the jars in foil and add a serving utensil to each container. Give each player a paper plate and spoon. Ask guests to put a glob of each on their dishes. After everyone is served, participants taste the samples and guess which flavor they are eating. When finished, reveal the labels to see who has the most accurate taste buds. Be sure to videotape the players’ funny faces. The winner could receive a food basket or a gift certificate to a local cafe. Hollywood Babies: Scatter pieces of paper that say celebrities’ names and their kids’ names on each table, which should be covered with a material that can be written on. Players draw lines to connect each baby to the star parent. The table with the most correct matches wins a prize, like recent issues of celebrity magazine. Baby’s First Year Book: Set up a station with scrapbook materials. Encourage party guests to create special pages for the new babe. Consider dividing the tome into categories, such as Baby’s First Bath and Baby’s Friends, and assigning one category to each table. Assemble the pages in a scrapbook for the parents to keep and embellish with pictures of their new family member. Have a bakery tint a loaf of bread pink or blue that you’ll use to make colorful sandwiches. Or, cut footprint shapes with a cookie cutter and put the cutouts on the tables. Serve beverages in baby bottles with colorful straws. Or put those invites to use, especially if you ask guests to bring the complete package to the party. This way, you can dole out Baby Cube Punch and even make another game out of it. Fill ice cube trays with water, putting a plastic baby in each compartment. Freeze until the cubes are firm. Give each guest a cup of punch with one of the special ice cubes. When the ice melts, the baby floats to the top. The first guest that has a floating baby and yells, “My water broke!” wins. Send attendees home with disposable cameras they used to take pictures at the celebration, mini chocolates, clear baby bottles filled with pink or blue jelly beans, teddy bear key rings or rubber ducky soaps. These favors can easily be found online and in party supply stores. For winners of games, you can also give baby-related movies, like Nine Months and Father of the Bride Part II.